Pan-fried Brussels sprouts with tangy pomegranate molasses, mint, pickled red onion and crispy red & wild rice: because side dishes don’t need to be boring. Perfect for the festive table, or as a perky midweek addition to a meal. An anti-inflammatory recipe. In collaboration with Waitrose #ChristmasTogether. Whether or not you celebrate Christmas, December 25th is a time to get together with family and friends. Perhaps you sing songs around the piano; maybe you cuddle up on the sofa watching movies. Or the hearty among may go out and build a huge snowman, or set out for a long walk in the crisp air. For us, we are a small family, very diverse in age, but we all love our food. My lovely in-laws Ann and Bob come round, picking up great-aunt Trudy on the way, and we kick things off with homemade sausage rolls (or this year I’m making these veggie haggis sausage rolls), smoked salmon with homemade blinis and a glass or two of Champagne. Michael Buble is usually crooning in the background while we pass round presents and nibble away. We then play some games while trying desperately to convince ourselves that we will be even a teensy bit hungry for our late lunch. We always manage. 🙂 Once we bucked tradition and ordered a Chinese takeaway – seriously! We were flying out very early on the 26th and this seemed the least stressful option. We had a great time. But it was a bit odd slurping up noodles and asking to pass the soy sauce. The main thing was – sitting cross-legged on the floor, surrounded by torn wrapping paper and those familiar plastic cartons – that we were together. Earlier this week I got to experience an early Christmas celebration – complete with Secret Santa – at North London’s Bull and Last, and hosted by Waitrose. It felt like I was stepping into their 2017 Christmas advert. The windows were frosted with (convincing artificial) snow, and the interior was dark, cosy and beautifully decorated; the long wooden table simply laid with a classic dinner service, greenery, wood and lanterns. We weren’t exactly snowed in, but it was very atmospheric. I had to keep reminding myself it was still November! Among the guests were some familiar faces – John Waite, Edd Kimber and Martha Collinson, previous winners and contestants on GBBO. But I was looking out for my blogging friend Lucy, of Supergolden Bakes. After “cheersing” our good fortune at being at this fab do, we mingled with the other guests, nibbling on proffered canapes, including warm, filled mini croissants with bloody mary shots, scrumptious lobster Thermidor bites (where I embarrassingly and not without risk to my teeth, mistook the shell for a cracker), and adorable Christmas tree vol-au-vents. I’m stealing the latter idea! We also had a go at making gingerbread martinis, which was hilarious and dangerously good in equal measure. Suitably merry Lucy and I ascended the centuries’-worn staircase to a floor laid out with tables of Waitrose Christmas food and awesome festive props to photograph. We were having such a jolly time that we were the last to sit down to dinner. Oops. As much fun as it is to photograph food, it’s even better to eat it. You can see from the menu that we had a gorgeous selection of dishes to choose from. Most of the food was family-style so it was good fun passing our plates round to have it loaded up by our neighbours. The food we ate was a mixture of food that can be purchased ready to cook, and some vegetarian side and main dishes developed by the Waitrose Cookery School (who cooked our splendid meal for us). And as if that weren’t enough, the bar was cleared of our martini-making mess and filled with desserts – Black Forest sparkle bar, salted caramel profiterole tart and – my favourite – mocha cheesecake. I was tempted to smuggle a few slices away with me for the overnight train home to Edinburgh. But luckily we each had a cheeseboard to take away with us. Really. The desserts, like the meal, were paired with spot-on wines. Sadly, we had to go back out into the real world (where it was not snowing – boo). It was a hugely enjoyable evening with great company, fabulous food and drink, and hugely atmospheric. I don’t think I can hope to live up to our evening, but a trip to Waitrose would help! From now until Christmas, Waitrose is celebrating the joy of being together and you can take part, too. Share photos and videos of how you’re spending #ChristmasTogether on Twitter, Instagram and Facebook for the chance to win some spectacular festive prizes, such as KitchenAid mixers, magnums of Laurent-Perrier Champagne, decorated, fresh Christmas trees, and luxury Waitrose Christmas Hampers. More information and T&Cs here. My UK readers, do take the opportunity to post on your social channels how you spend #ChristmasTogether. I’ve said it before but you have a real chance of winning a prize. I did many years ago (before I was on their radar) and won an invitation to a luxurious Heston Blumenthal summer barbeque in Bray, Berkshire. Go on and do it! 1. Cook the rice in double the volume of water for 20 minutes. This result will be al dente rather than soft. Drain and let cool. Set aside. 2. While the rice is cooking, heat half of the oil in a heavy saute pan (I adore my Staub) and add the Brussels sprouts cut side down. Let them start to brown then pour over enough water to come up about 1/4 inch. Pop on the lid and simmer until the water is absorbed. 3. Put the salt, sugar and vinegar in a small pan and heat until the salt and sugar dissolves. Turn off the heat, add one large ice cubes, let cool then add the sliced red onions. Let the onions sit for at least 10 minutes, then drain. 4. Drizzle the pomegranate molasses over the sprouts and gently turn with a spoon. Add the sprouts to a serving dish. 5. Heat the remaining oil in the saute pan and add the cooked rice and a good pinch of salt and pepper. Saute until crispy. 6. 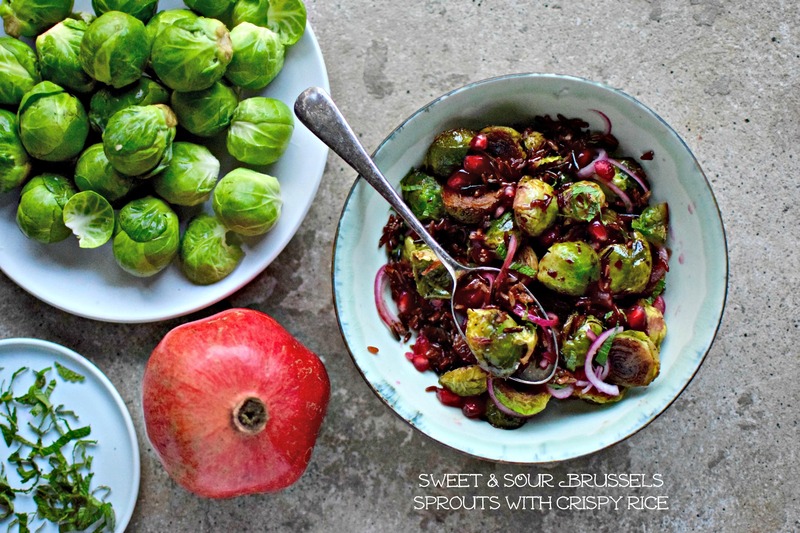 Sprinkle the onions, mint pomegranate seeds and crispy rice over the Brussels sprouts and serve warm. Fancy making a very special festive layer cake? Check out Lucy’s cake recipe. It’s totally gorgeous! That sounds so tasty and something different to surprise the Christmas table. Always enjoy the inspiration of your posts, and the visual treat of them. Especially running up to Christmas, your lovely tips and advice, shared in such a reassuring way. Gorgeous! What a fun spin on Brussels. Awesome ! Love these beautifully caramelized brussels ! The set up for the feast looks wonderful! It’s amazing inspiration for table setup for the holidays. The sweet and sour Brussels sprouts look absolutely delicious as well! I would love to try it one day! You had me at pomegranate molasses! Lovely way to serve brussels! So many of my favorite things, caramelized Brussels, pomegranate molasses, vinegar, mint. I might consider making this one of our holiday sides! Going to try this recipe myself this Thanksgiving. Maybe the kids will eat their sprouts this time…. Ooh thank you, I feel really Christmassy now! I love the sound of this and the photos are wonderful. I hope my Christmas table will look so colourful.